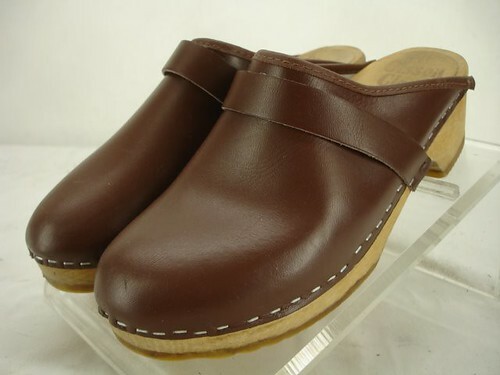 I won this pair of Olsson clogs on eBay. I hope they work out! I wanted a pair of Sven clogs from the same seller because they had a little buckle on them, but I didn't care to get into a bid-fight. These ones are virtually identical, anyhow. I decided I wanted a pair of clogs after visiting Jumelle in Williamsburg -- they had some Svens in the window and they were so pretty. I am a little torn, however, as I always am with footwear that straddles the line between frump and chic. Ah well, some will get it and some won't, and I like them. They are my graduation present to myself from myself (a very modest present, but it's the best I can do at the moment). I'm done with school next Thursday, after an exam. I cannot wait. And then comes the crushing rejection inherent to the job hunt! Hooray. My love of ruffles continues. See this? This is smock 'N' from my beloved Stylish Dress Book. I haven't tried to make anything from the book (I've only looked through it and sighed about three hundred times), as I am a bit intimidated and worried that even the largest of the three sizes included will not fit me. I decided to start with this one since it looks simple enough. And it is! Three pieces cut on a fold and bias tape. I made the pattern today; I enlarged it a tiny bit as I traced it. I sewed up a quick muslin using an old bedsheet, totally lazy-style: I sewed it on my serger (ha! Including the bust darts!) and didn't bother to make the bias tape. Ten minutes later, I saw that it fit, and I was pleased, but... is this too apron-like? If yes, is there anything wrong with an apron-like smock? Please advise. It looks great on her, but on me, I'm not so sure. Oh to be an A cup!